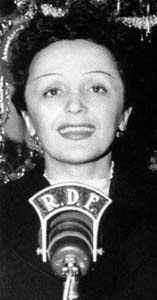 Edith Piaf (December 19, 1915 - October 11, 1963) was one of France's most beloved singers, with much success shortly before and during World War II. Her music reflected her tragic life, with her specialty being the poignant ballad presented with a heartbreaking voice. The most famous songs performed by Piaf were La Vie en Rose (1946), Milord (1959), and Non, Je Ne Regrette Rien (1960). She was born �dith Giovanna Gassion in Paris, France; her mother worked as a cafe singer and her father was a well-known travelling acrobat. Abandoned by her mother, she was raised by her paternal grandmother, who ran a brothel in Normandy. From age 3 to 7, she was blind. As part of �dith Piaf's legend, she allegedly recovered her sight after her grandmother's prostitutes went to a pilgrimage to Saint Th�r�se de Lisieux. Later she lived for a while with her alcoholic father, whom she left by age 15 to become a street singer in Paris. In 1935, �dith was discovered by the nightclub owner Louis Lepl�e whose club was frequented by the upper and lower classes alike. He convinced �dith to sing despite her extreme nervousness, and gave her the nickname that would stay with her for the rest of her life: La Mome Piaf (The Little Sparrow). From this she took her stage name. Her first record was produced in the same year. Shortly thereafter, Lepl�e was murdered and Piaf was accused of being an accessory; she was acquitted. In 1940, Jean Cocteau wrote the successful play Le Bel Indifferent for her to star in. She began to make friends with famous people, such as the actor Maurice Chevalier and the poet Jacques Borgeat. She wrote her signature song, La Vie en Rose, in the middle of the German occupation in World War II. During this time, she was in great demand and very successful. Singing for high-ranking Germans at the One Two Two Club earned �dith Piaf the right to pose for photos with French prisoners of war, ostensibly as a morale-boosting exercise. Once in possession of their celebrity photos, prisoners were able to cut out their own images and use them in forged papers as part of escape plans. Today, �dith Piaf's association with the French Resistance is well known and many owe their lives to her. After the war, �dith toured Europe, the United States, and South America, becoming an internationally known figure. She helped to launch the career of Charles Aznavour, taking him on tour with her in France and to the United States. Piaf had one child, a daughter, Marcelle, who died at the age of two in 1935; the child's father was Louis Dupont. The great love of Piaf's life, the boxer Marcel Cerdan, died in 1949. Piaf was married twice. Her first husband was Jacques Pills, a singer; they married in 1952 and divorced in 1956. Her second husband, Theophanis Lamboukas (a.k.a. Th�o Sarapo), was a 20-years-younger hairdresser turned singer and actor; they married in 1962. The Paris Olympia is the place where �dith Piaf achieved fame and where, just a few months before her death, she gave one of her most memorable concerts while barely able to stand. In early 1963, �dith recorded her last song, L'homme de Berlin. Piaf died of cancer in Cannes on October 11, 1963, the same day as her friend Jean Cocteau. She was buried in the P�re Lachaise Cemetery, Paris. Although forbidden a Mass by the Roman Catholic archbishop of Paris (because of her lifestyle), her funeral procession drew hundreds of thousands of mourners onto the streets of Paris and the ceremony at the cemetery was jammed with more than forty thousand fans. Charles Aznavour recalled that Piaf's funeral procession was the only time, since the end of World War II, that Parisian traffic came to a complete stop. There is a museum dedicated to Piaf, the Mus�e �dith Piaf at 5, rue Crespin du Gast, 75011, Paris.